I’ve said this before but i’ll say it again… trying to analyse Serena’s draw is always tricky because when she’s on, she beats everyone. As draws go I don’t see many, if any, stumbling blocks before the quarter-finals. Serena plays Magdalena Rybarikova in the first round which is an ideal opener against a player who has never done much on clay and retired from her last match on the ITF circuit, down 2-4 in the first round of Trnava to Viktoria Kuzmova. Serena is seeded to meet Kristina Mladenovic in the third round; the Frenchwoman has a sure-to-be-on-a-show-court first rounder against Francesca Schiavone which sounds FUN. This is one of those matches I expect to go deep into a third set and really get the crowd going. The love affair between Fran and Paris is making me lean towards the Italian in this one. The most likely third round opponent though for Serena is, in my opinion, Timea Babos. The 23-year-old is having a wonderful year, currently sitting at number 15 in the Race to Singapore and with 20 victories in singles this year. While she’s never made it past the second round of a Slam before, I think she has a great chance to break new ground with this draw. I momentarily forgot that Ana Ivanovic reached the semi-finals of Roland Garros last year and I was generally fearful for her prospects this year. The draw gods though have been reasonably kind. If she can get past the first round against Oceane Dodin, the huge-hitting Frenchwoman, then i’d like her chances to book a fourth round match with Serena. Ivanovic is seeded to meet Elina Svitolina which is a dreamy match-up for the Serb… Ivanovic leads the head-to-head 7-0 (!) and has dropped just one set in those encounters. Add to that, Svitolina has won just one match on red clay this year. In fact, i’d tag Svitolina’s first round match against Sorana Cirstea as an upset alert. In all my years of following the WTA, I can’t remember a stronger list of qualifiers and one of the more dangerous is Cirstea. Sporting a re-modelled serve after years of woe with the shoulder and coupled with, dare I say, more thoughtful tactics, Cirstea looked great in Madrid where she picked up wins over Jelena Jankovic, Danka Kovinic and Laura Siegemund. Also, she didn’t buckle under the pressure of expectation in qualifying for Roland Garros. Cirstea won all three of her qualifying matches in straight sets and didn’t drop more than four games in any of the sets she played… watch out for Sorana! There are question marks around many players in this draw and none more so than Victoria Azarenka. The back injury that flared up in Madrid and Rome could be an issue although comments made in press imply she’s been practising without pain. The first few rounds should give her a chance to settle with Karin Knapp up first. Her third round opponent is one i’ve got my eye on! Azarenka is seeded to meet Andrea Petkovic, who takes on Laura Robson in one of the more engaging first rounders. 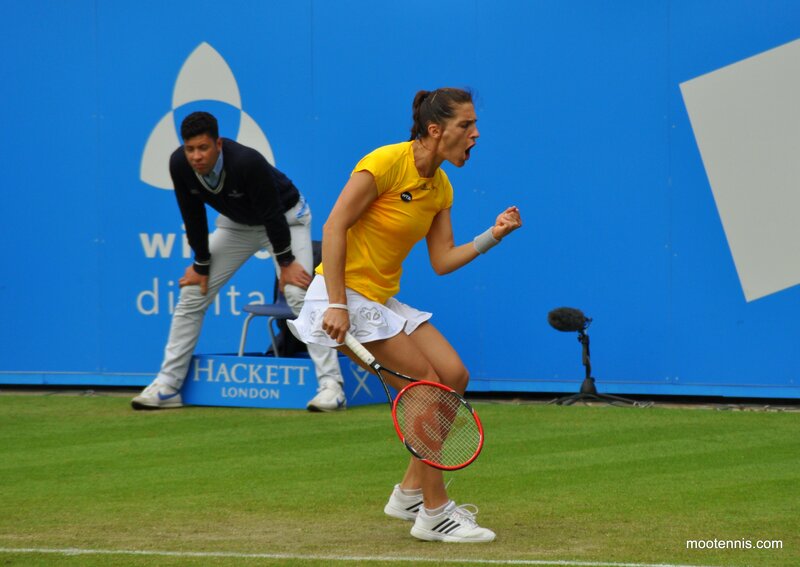 Robson has a habit of raising her game for the calibre of opponent and Petkovic hasn’t won a match since Stuttgart. Still, i’m finding it hard to fathom that Robson will have the consistency in all aspects of her game, particularly on serve, to outlast Petkovic. The winner could play Yulia Putintseva which is just all-round WTA goodness. The other side of this eighth houses Carla Suárez Navarro and Dominika Cibulkova… and i’ve been racking my brain trying to separate them! I wouldn’t be surprised if either came unstuck in the first round; Cibulkova plays Saisai Zheng and always seems to play long drawn-out three setters at the starts of tournaments, while Suárez Navarro gets another confident qualifier in Katerina Siniakova who won the ITF tournament in Trnava before winning through three rounds of qualifying. Still, i’d expect both to make reach the last 32. Cibulkova leads Suárez Navarro in their head-to-head, 3-1 although CSN won their last match in Moscow. The Spaniard is likely to be more at home on the clay but the loss to Bacsinszky in Rome is worrying to me and if it came to a three set tussle, Cibulkova’s intensity might be the difference. The one with all the K’s… i’m loving this section! The projected third round matches are Angelique Kerber v Daria Kasatkina and Johanna Konta v Madison Keys. Kerber-Kasatkina is on my dream list of WTA match-ups so it would be awesome to get that match-up. Kasatkina did well to reach the third round in Rome, taking out Karolina Pliskova in the first round, but her form has not been that of the first few months. This is her first year on the tour so everything she does I will continue to take with a pinch of salt despite my high expectations. Kasatkina’s first round match against Anna-Lena Friedsam will be an interesting one… the Russian player won their only previous match in straight sets at Indian Wells. For Kerber, I really don’t fancy her chances and if the weather forecast is accurate for the first few days of the tournament (where rain is on the cards), I think she will struggle. First up is Kiki Bertens who is in the final of Nurnberg and has generally been playing good ball all year. When the pair last played in Miami, Bertens was a set up before she was forced to retire with a stomach complaint. I think we’ll know pretty early whether Kerber’s up for this clash. Personally, I think her mind will be focusing towards the grass where I think she’s going to do great. Still, i’m not quite brave enough to go for the upset as I wonder if fatigue could set in for Bertens. The other section of K’s is highlighted around Konta and Keys. The American opens against Donna Vekic which seems like a good draw while Konta plays Julia Goerges, a tricky one against the Nurnberg semi-finalist and a player who reached the last 16 of the French Open last year. Keys’s second round also rings alarm bells; she could play Mariana Duque-Mariño or Daria Gavrilova. MDM is in the final of Nurnberg (three of the four semi-finalists from this tournament are in this section!) while Gavrilova’s form has improved significantly over the past month. Keys defeated Gavrilova in Fed Cup action but this feels like a match-up where the Aussie could bamboozle the American. I was impressed though with what I saw from Keys in Rome and while it feels like jumping on the bandwagon, I think she makes quarters here. As draws go for the top eight seeds, Bacsinszky’s is rough. She was set to face a qualifier in the first round and actually, it could have been a lot worse! The Swiss player will open against the lucky loser, Silvia Soler-Espinosa. Bacsinszky’s won all three previous matches, never dropping more than two games in any of the six sets they’ve played. The trouble would come in the second round where she is set to play either Eugenie Bouchard or Laura Siegemund. This is my favourite first round match and it could be a wild (but enjoyable!) ride. Siegemund’s form has been sensational this year and she has a habit of winding her opponents up, not just with her game! I wonder if she may be fatigued from her heavy schedule of late but when I first saw the Bouchard-Siegemund match-up, my instinct went for Laura. Fun stat… Bacsinszky and Siegemund’s only previous match on the tour was in 2006. Bacsinszky’s only match with Bouchard came earlier this year at Indian Wells which she won in three sets. Looking at Timea’s third round, she is projected to meet Monica Niculescu. Bacsinszky had always struggled against the Romanian (so many players do! ), losing four of their five clashes heading into a pivotal fourth round clash at Wimbledon last year. Bacsinszky lost the first set, 1-6, but found a way back to win in three. Also worth a mention in this section is the return of Mona Barthel! Mona is set to play her first match since the Australian Open following months of health problems, up against Irina Falconi. This is an interesting match because i’m not 100% sure that Mona will play (she’s in the draw, that’s encouraging enough) and the same can be said for Irina who picked up an injury in Nurnberg. The other side of this eighth is equally intriguing. Venus Williams is present and seeking to reach the third round of the French Open for the first time since 2010. She plays Anett Kontaveit in the first round. I think Venus is vulnerable on clay but i’m not feeling an upset alert with this one. Kontaveit hasn’t played since Miami and I distinctly remember watched their fourth round match at the US Open where the Estonian player didn’t have the patience or variety to unsettle Venus. 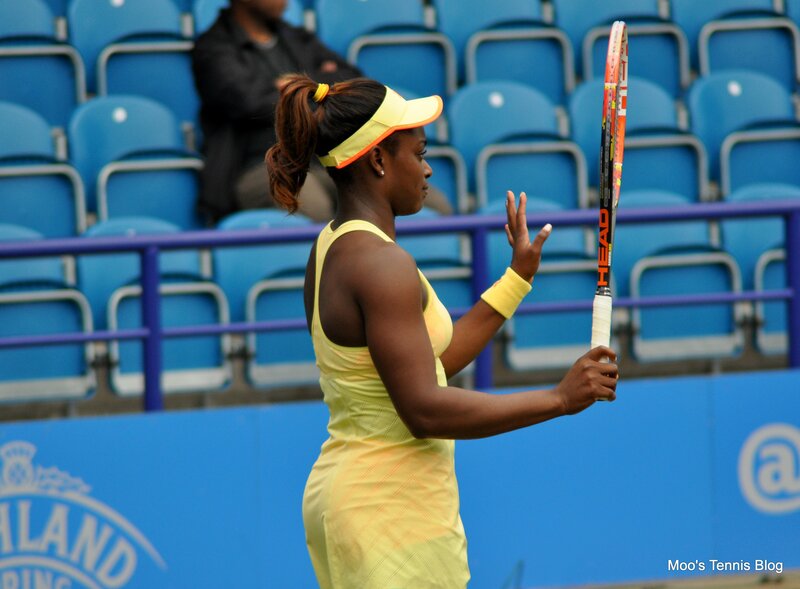 If Venus were to progress to the second round, she’d play an American; either Lauren Davis or Louisa Chirico. I was really impressed that Chirico, the number one seed in qualifying, managed to qualify. Playing as the number one seed brought a lot of expectation and attention and having come off such a brilliant run in Madrid where she reached the semi-finals, a stumble wouldn’t have been a big shock. I think Chirico can do some good things with this draw. Venus is a legend but on clay, I don’t back her chances despite her always valiant efforts. Chirico’s first rounder against Lauren Davis won’t be easy… they last played in Monterrey where Chirico led 6-4 4-1 but went onto lose in three sets. This section also features a first rounder between Alizé Cornet and Kirsten Flipkens which has produced some dramatic encounters in the past (yeahhhh i’m thinking Dubai!). I’m getting my hopes up for a potential Cornet-Jankovic second rounder which could be delightful. Jankovic will be looking for a first win since Indian Wells. I actually like her draw and think she might rediscover some form in Paris, a place she’s done well before, to reach the second week. Is it wrong that I laughed when looking at this eighth?! I mean, if there’s any section that is going to crash and burn with the seeds, then it has to be this one! At the top is Roberta Vinci who played some great tennis through the last few months, but has lost her way, coupled with some injuries. Vinci has just three wins on the clay this year and she hasn’t done well at Roland Garros for the past few years. Players in her section such as Kateryna Bondarenko (1st round) and Annika Beck (potentially second round) are ones i’d expect Roberta to beat… but equally, if she’s not on her game, they are capable of creating upsets. The one to watch from the whole section is Irina-Camelia Begu. The Romanian player was the most consistent player through Madrid and Rome, reaching the quarter-finals and semi-finals respectively. After an injury-affected start to the year, Begu’s form has been solid since Miami. She makes me want to hide behind pillows when she serves out sets and matches but with all the wins over the past few weeks, I think the confidence is there. Her first rounder against Bethanie Mattek-Sands is almost too perfect. Begu is 4-0 in their head-to-head and BMS has won just five singles matches all year. Based on form, Begu should be all over this section. She has always been prone to a bad loss here or there so I remain a little wary… but I do think she makes quarters from this draw. Petra Kvitova is the second highest seed in this section. I love Petra but i’m never convinced by her exploits on clay! She plays Danka Kovinic in the first round who she barely passed at Indian Wells earlier this year, 6-3 4-6 7-6(5). Kovinic came within two points of the match. The Montenegrin has a game made for the clay and secured her first ever top ten win in Madrid where she ousted Roberta Vinci. The Kvitova-Kovinic match-up is worthy of the upset alert, but something is telling me Petra gets through it. Karolina Pliskova is also in this section but i’m not expecting much and I like Elena Vesnina to reach at least the third round. Vesnina has won a whopping 22 singles matches since Doha and I love the way she has been playing of late. This section is all about Garbiñe Muguruza and Svetlana Kuznetsova for me… i’d love to see a fourth round match-up between the pair but again i’m wary! Kuznetsova has often peaked at Roland Garros but her draw makes me nervous. First up is Yaroslava Shvedova… surprisingly, they’ve never played before. Shvedova has lost her last three matches but she’s the sort of the player that I think can cause Kuznetsova problems. It’s one of those matches where i’m half expecting Kuznetsova to lose! 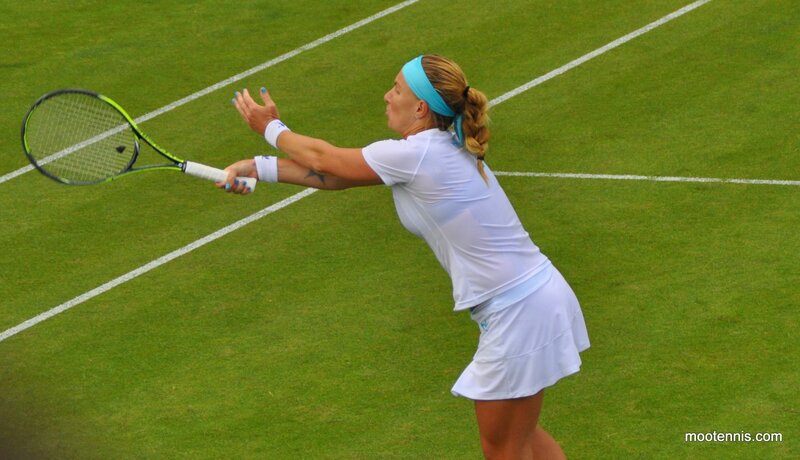 Kuznetsova is seeded to meet Anastasia Pavlyuchenkova in the third round; in a wonderfully WTA head-to-head, Kuznetsova leads it 4-1, but when they played in Wuhan last year, Pavs won for the loss of just one game. I’m intrigued by Pavs’s first round match against Sara Sorribes Tormo. Like I was talking about Kuznetsova above, this feels like one of those matches which Pavs will find a way to lose. Sorribes Tormo is decent on clay and I always like the qualifiers as they’ve had time to adjust to the courts and have confidence from three victories. In this case, i’d actually go for the Spaniard with Pavs prone to throwing in a shocker here, there and well in 2016, pretty much everywhere! I’m fond of her game so I hope i’m wrong. One of the feel-good stories already of the 2016 French Open is for Turkish tennis where Cagla Buyukakcay and Ipek Soylu both came through qualifying and will play in the main draw of a Slam for the first time in their careers. Both also have winnable openers and Buyukakcay, who opens against Aliaksandra Sasnovich in this section, has a potentially workable draw. For the second time in three tournaments, Muguruza opens against Anna Karolina Schmiedlova. It would seem to be a decent draw with Schmieds losing her last 11 matches on the WTA tour and all in straight sets. This draw is a case of déjà vu as Muguruza could play Christina McHale again in the second round; the Spaniard put in a listless display when they last played at Indian Wells earlier this year. Muguruza is seeded to meet Ekaterina Makarova in the third round, who she thrashed in Rome just last week. I’ve had good vibes about Muguruza for this tournament since the start of the year. She’s close to the breakthrough result this year and I feel it could be here… i’m just stuttering with this draw a little though! Pre-draw, I felt good about Simona Halep providing Mirjana Lucic-Baroni was nowhere near her in the draw… I couldn’t help but laugh when I noticed the pair *could* meet in the third round. Note that Lucic-Baroni has beaten Halep twice before at the Slams including last year at the French Open. Furthermore, MLB is doing THINGS in Strasbourg this week, reaching the final and dropping just eight (!) games in wins over Babos, Parmentier and Mladenovic. MLB is an absolute nightmare when she’s finding the court so it will be intriguing to see if she brings that form into RG. Stepping back to Halep and I don’t see any major problems before the third round. It’s likely that the third round will be the make-or-break and the crux of her tournament run. Jelena Ostapenko is the projected seed for Halep in the third round although based on recent form, MLB might be the more likely opponent. Ostapenko opens against Naomi Osaka which is a match that I want to watch! Osaka’s gone a little quiet in recent times and my guess from watching her play in Charleston is that clay’s not really her thing. I was praying that Lucie Safarova would get a good draw… and I think she has! Vitalia Diatchenko is a nice opener and Sam Stosur in the third round should be OK. Lucie has a great record in the head-to-head and Stosur has a slight concern with a wrist injury that forced her to retire (very rare) in Strasbourg. In truth, i’m bummed they have to meet early because both could go far with the right draw. I’ve really got no idea how Lucie will get on this week. I’m sad that she won’t be with her coach, Rob Steckley and I wonder what effect that will have on her after they had such a wonderful fortnight last year. The pressure to defend points could be an obstacle for Lucie but I also think that with her recent struggles to overcome the effects of the bacterial infection, she might be able to focus on the joy of actually playing this tournament again which didn’t look likely for some time. This bottom half could be cut up into mulch… there’s quality players but quite a few of the seeds are out-of-form. Agnieszka Radwanska bookends the draw and to be honest, I don’t think anyone (myself included) is circling the number two seed as a contender. She’s made no secret that grass is the priority. Still, she’ll want points here! She plays Bojana Jovanovski in the first round which would have the potential to be a dangerous match-up if it weren’t that Jovanovski was playing her first match since February. Caroline Garcia in the second round could be a more lively threat. I do like CarGar but she often fails to deliver on promise and I worry about expectation of playing in Paris. Kudos though to her efforts in Strasbourg where she’s in the final. If anyone’s going to upset Radwanska’s applecart, i’d actually go for Barbora Strycova in the third round. The Czech player is having a superb year and I don’t think she’d be too perturbed by a 0-4 head-to-head record. Strycova has been sneaking up on a few big names this year and has been performing well at the tournaments that really count. I’m actually going for Strycova to reach the last 16 in one of my ‘wild’ choices… it feels wrong, but also right at the same time! The other half of this eighth could be blown to smithereens with Sara Errani and Sloane Stephens the two seeds; Errani hasn’t won a match on red clay this year, while Stephens’s most recent loss to Pauline Parmentier in Strasbourg was a head-scratcher. Stephens lost the first set, played some blinding tennis to win the second set, and then couldn’t capitalise on a double break lead in the third set before eventually going down in a passive mess (Note – Parmentier played well!). Stephens is the most puzzling player to analyse right now because it’s all there but mentally, things can often go awry. And let’s wrappppp it upppp…. If you’ve got to the end, well done to you. I’m sorry, I have rambled but there’s so much to talk about with the draw! And now to the final picks. It’s the usual dilemma of Serena or not Serena. In the end, i’ve gone for her as my champion. It was really close in my head with her and Muguruza. The only concern is that she could get complacent early on… but I just feel foolish to go against her. It’s worth noting that i’ve got Serena wrong every time this year so yeah… sorry Serena fans! May 20, 2016 in Roland Garros, Tournament Preview, WTA. Same as above! Sabine should skip clay and get ready for the grass!! I really don’t know what to say about Sabine! I’m glad to see she picked up a win in Nurnberg. I think she has a decent draw but i’m not really sure where her head is at. In my draw, i’ve got her through the first round. I’m intrigued to see how she does during the grass court season. I’m very surprised she has opted to play Mallorca over Birmingham. Jamess, so you are going for Begu over Petra in round of 16? On a separate note, here is a stat: Since Petra’s breakthrough in 2011, the even-numbered years – 2012 (won her first title of the year in August Montreal), 2014 (won her first title of the year in July Wimbledon) so 2016 (will win her first title of the year in June in Rolad Garros). August, July, June, this could be a trend haha!! So if she does win RG (my pick for the title, also laughing at my stupidity XD), her first title of 2018 should come in May Madrid! Really worried about Kuznetsova’s draw also but she often flourishes when she’s faced with a tough task so I will sit on the fence there. Loved the analysis James. Still a massive daily reader. I do think we will have a first time winner of RG. Hoping itss Halep or Muguruza. Can’t wait for it to begin this week. Thanks Denzil, really appreciate it. I’ve got a good feeling about Muguruza for this tournament. I’m tempted to go for Garbi in my draw challenge although gone for Serena right now. Just a bit worried about her draw with McHale, Kuznetsova and Begu all in her potential path.